Sleepy Hollow is a superb choice for Colorado mountain cabins. 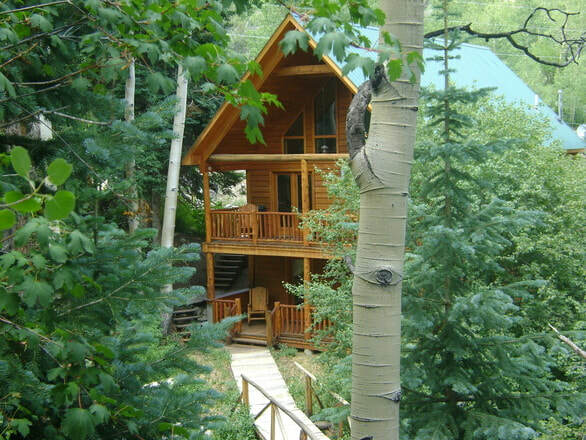 Located near Monarch Mountain Ski Area and Salida, Colorado, Sleepy Hollow Cabin is a picturesque choice for a Colorado mountain cabin rental! This area is ideal for a quiet getaway or even a family reunion. You'll enjoy the riverfront, fresh mountain air and majestic views. Whether you visit in the summer or winter, mountain activities are right outside. Twelve people can sleep in this beautiful Colorado mountain cabin. There are 4 bedrooms and 2 bath rooms. To reserve your lodging at our beautiful cabin near Salida, view our rates and contact us today!